Missionary Maggie E. Booker is the First Lady of Zion Temple Church of God in Christ. She loves the work of the Lord, sharing the word of God and ministering through praise and worship. She faithfully serves as the President of the Women's Ministry and is a Teacher for the Primary Sunday School class. In addition, Missionary Booker serves the pastor, Elder Robert E. Booker in a significant role as his Administrative Assistant. Missionary Booker's training in God's vineyard began in her youth when her beloved grandmother helped to mold her attitude toward commitment and service. To that end, Mother Booker learned to unselfishly give of her talents in the church. Today she is a dedicated and committed worker in the church who strives towards excellence. Whatever she does, she puts her whole heart and mind to it. Over the years Missionary Booker has made significant contributions to the church. 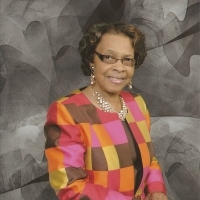 She was the District Missionary of the Rock of Ages District, Southern Illinois Jurisdiction, The President of the Pastor's and Minister's Wives Circle of the D.A. Reed Sr. District, the Program Chairperson of the State Minister's Wives Alliance, District Missionary of the D.A. Reed Sr. District, all in First Jurisdiction, Illinois. Currently Missionary Booker serves as District Missionary of the Edward Booker Memorial District, also of First Jurisdiction, Illinois. She is a profound leader, teacher, and worker in Christ's vineyard. Missionary Booker worked faithfully under the leadership of Mother Charlotte Eades, State Supervisor of Women (Emeritus), First Jurisdiction, Illinois. She is now under the leadership of Mother Shirley Hughes, State Supervisor of Women, First Jurisdiction. Missionary Maggie E. Booker worked in the Medical Records Unit at the former Hyde Park Hospital, for 16 years. She and Elder Robert E. Booker have been married 53 years. They are the parents of three sons, and 4 granddaughters, 2 grandsons, and 1 great grandson.